Filomena Campus the Sardinian jazz jester. Filomena Campus launched in London her new album “Jester of jazz”. The launching was made with two concerts the 26th and 27th January at Jazz Club Soho. 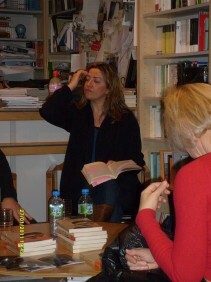 And additionally the 27th Filomena propped up Paolo Fresu in presenting his book at the Italian Bookshop. The Jazz Club Soho concerts were performed by Filomena Campus Quartet so composed: Filomena Campus (vocals), Steve Lodder (piano), Dudley Phillips (double bass), and Winston Clifford (drums). Furthermore featured performers were on the 26th Rowland Sutherland (flute), on the 27th Jean Toussaint (sax) and both the evening Paolo Fresu (trumpet). The 27th January concert was marvellous with all those very good players. Filomena has a powerful and eclectic voice, Fresu and Toussaint were delightful and the rest of the band showed great talent. The music of the “Jester of jazz” is, of course, jazz and in a neat style. But there is also an original blend with theatre metaphors evoked by poems and literature. Campus plays with the colours of jazz music, mixing the jesters style with her Sardinian legacy. Filomena paints her performances with the colours of the Harlequin costume. In 2010 Filomena founded the ‘Filomena Campus Quartet’ with Steve Lodder, Dudley Phillips and Winston Clifford and “Jester of Jazz” is their new original project. Filomena Campus is also Theatralia Artistic Director Since 2006 Theatralia’s productions have been sponsored by the Arts Council England. Theatralia have performed once a year their “Interludes”, multimedia performance/happenings of free improvisation featuring top UK jazz musicians, performers and visual artists. Filomena has performed in several international festivals and in many different countries. Her theatre performances are highly inspired by jazz music. The last 27th January, after the presentation of Paolo Fresu’s book was over, they both moved to Jazz Club Soho where they had the concert. After the concert we met Filomena Campus and had a nice interview. You do this show with a quartet that has your name. Additionally tonight there were two guests. It is a show that is called “Jester of jazz” and with my quartet we have done two dates here. As guests in the first one we had Rowland Sutherland, in the second Jean Toussaint, both of them they play in the album also called “Jester of jazz”. And for both the concerts I invited Paolo Fresu as a guest too. So your connection with Paolo Fresu: tonight as well this Sardinian soul could be seen. Well yes. Of course I met Paolo in Sardinia and namely I know him his concerts. Then few years ago I attended to jazz seminar Paolo organize in Nuoro and it was a revelation. I mean it was a special occasion, as in Sardinia unfortunately there are not much. But that seminar was an occasion to improve myself, to learn jazz. And from that seminar I understood were my way was. You live in London but work in Berlin too. I live in London but very often I got to Berlin. I work in Germany and in Italy but live in London. My house is London. The title is inspired at the Nobel motivation to Dario Fo in 1997 where he was considered the jester, in the most original meaning of the term, like jesters were considered in the medieval time. So this in this album the jester, the clown, it comes out with my presence on stage. There are some lyrics from Stefano Benni. France Rame collaborated in writing a lyric. However this work is connected to my character which is also to be a theatre director. So theatre and jazz get together in one only idea. Promote this project firstly and tour it around Europe. So I wish I can tour with it anywhere as far is possible. For this moment this is the future project. « A focus on the art of ballet at the National Portrait Gallery.